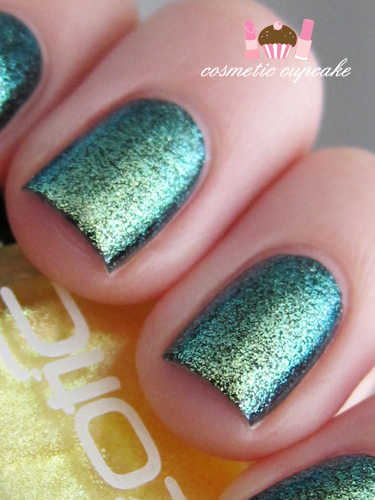 Today I have some quick swatches for you of Ozotic Pro 904 - one of the brand new polishes from their new Sugar collection. The Sugar polishes are inspired by "'adding a tiny drop of food colouring to icing sugar' hence the sugary sweet looking colours". Let me warn you it is pretty amazing! 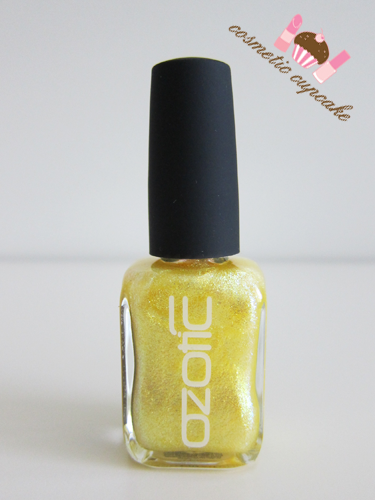 904 is a bright yellow polish containing colour changing crystal flecks that aren't really apparent in the bottle. When layered over black it really comes to life! The crystal flecks shift from green to blue to a teeny bit of yellow depending on your lighting. I layered 1 thin coat over 2 coats of Glitter Gal Serpent Black. The polish dried quite quickly and the brush was great to use. I recommend working quickly and applying thin coats as you can get patchiness. I had to redo my swatches as I worked too slowly and had to add more coats of 904 to even things out which didn't look too good especially when on macro! Overall I think it's a really unique polish! I love that it transforms a boring black polish into something really unusual. I got lots of lovely compliments when I wore it so definitely one worth trying out for yourself! 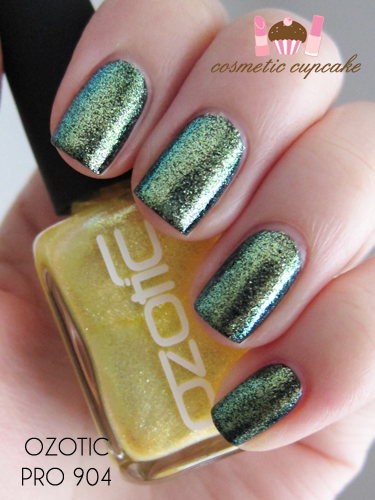 The new Ozotic Pro Sugar & Beam collection is available in 8 shades and can be purchased from Picture Polish for $12. What do you think of these new Sugar polishes? Thanks for looking as always! WOW! Heading to that site now to grab some of these, I don't really do classic nail looks I like things that are exciting, like this!